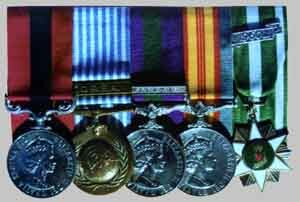 This set of medals tells us the owner is a soldier who is awarded the Distinguished Conduct Medal, most probably whilst serving in Vietnam. His service includes the UN Forces Korea, the Malaya Emergency and Vietnam. The Naval General Service Medal 1915-62 with clasp Malaya awarded for service afloat for 28 days patrolling off the Malaya coast in support of operations against bandits, and attachments ashore etc. 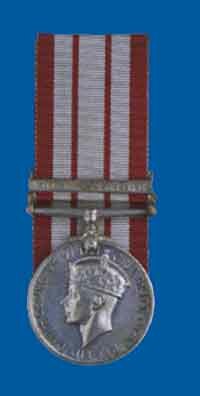 The British General Service Medal (GSM) 1918-62 with clasp Malaya awarded for one (1) days operational service in Army or Air Force units during the period 16 June 1948 to 21 July 1960 and in Singapore from 16 June 1948 to 21 January 1959. The British General Service Medal 1962 with clasp Borneo donating 30 days operational service in Borneo. The clasp Malaya Peninsular donated 30 days operational service on land in Malaya or Singapore including afloat in the waters during the period 17 August 1964 to 12 June 1965. RAAF personnel includes 30 or more operational patrol during the period 13 June 1965 to 11 August 1966.